Posted: Thursday 18th October 2018 in Retail Strategy, Thought Leadership. Christmas will soon be upon us, and while the prospect of planning for the festive season can be overwhelming for consumers, for retailers, that planning occurs well in advance. After all, have a poor peak and you’ll likely be in trouble for the remainder of the year. But what can we expect to see this year? As more and more consumers move online to purchase their gifts, wrapping paper and even the Christmas turkey, we’re seeing a seismic shift in shopping habits. Here, we’ve shared some insight into what we could see at peak this year. But first, let’s start with a look at last year’s statistics. As was to be expected, Christmas 2017 continued the trend of year-on-year sales growth over the festive period, however this was offset by that growth being slower than in 2016. In fact, sales only grew by 1.4% last year, compared to 1.9% the year before. But how does this translate into cash? UK consumers are still spending significantly more than other big European economies with over £78 billion in sales in the six weeks from mid-November to the end of December. Black Friday 2017, much to the surprise of many analysts, continued to perform well for retailers, but it’s apparent that this US export is moving to an increasingly online phenomenon. Total spend over the four-day weekend (encompassing Friday to Monday) was up over 12% last year at £3.1 billion online. Individual household spending rose over peak, with the biggest increases coming in the apparel, toys and electronics categories. 2017 showed to be increasingly mobile-orientated when compared to previous years with 49.7% of online transactions taking place on a smartphone or tablet. PC sales still edged ahead however, but by a much smaller margin; desktop took a share of just over 50%. Looking at Black Friday, mobile and tablet transactions rose to 56% in 2017, the highest share they have seen. In Germany, this was the case in 2017 with mobile or tablet receiving a 50.2% share of sales. With mobile buying becoming progressively important to consumers, mobile sites need to be optimised to allow for this shift in shopping habits. This year, predictions point to mobile finally overtaking desktop as the main source of online sales across the entire peak period. 2) Is the Boxing Day Sale Dead? As retailers begin to discount stock before Christmas Day, in an effort to boost revenue, the traditional Boxing Day sale is becoming less impactful. In fact, conversion rate post-Christmas and through to mid-January has been much lower than the period running up to Christmas Day. In December 2017, non-food retail prices fell by 2.1% year-on-year, attributing to more sales but with a lower profit margin. This impacted many retailers as brands desperately sought out as many sales as they could in the run-up to Christmas. However, those retailers not participating in Black Friday or any pre-Christmas discounting, Marks & Spencer being one, saw a shift back to a much more traditional peak pattern, encompassing a Boxing Day sale. This year, we’re likely to see a similar story as consumer confidence remains at its lowest level since July due to the uncertainty around Brexit negotiations and the increasing cost of living. Some retailers will discount stock well before Boxing Day to entice customers to drive footfall in store and online revenue prior to Christmas Day. So, we’re more than likely see mobile overtake desktop as the leading source of online sales across peak in 2018, but what about the customers themselves? Recent research has shown that 23% of shoppers will have started their Christmas shopping by the end of September. For retailers and marketers, this means that competition is low allowing for more impressions per pound, albeit with less demand. Once October hits, 53% of people have started their Christmas shopping. This coincides with the first TV adverts and more visibility of Christmas in stores. From a marketing point of view, click-through-rate will steadily increase but behaviour still focuses on the researching phase, rather than purchasing. Black Friday comes towards the end of November and the deal hunters are out in force. These shoppers tend to be buying for themselves, with electronics being sought by many. Website visits peak at different times of the day dependent on the device used. Mobile sees its highest visits early in the morning as people arrive at work and scope out the latest deals, whereas tablets see their peak throughout the evening as customers sit at home for some last-minute bargain hunting. In terms of delivery, click and collect may prove popular this year as Christmas Day falls on a Tuesday, meaning late shoppers could be nervous about relying on the postal service and the British weather. 2018 has seen more and more big high street names fall on hard times. With House of Fraser being rescued by Sports Direct’s Mike Ashley and the news in October that UK high street veteran, WHSmith, is closing stores due to ‘challenging conditions’, times are tough for British retailers. This year, we’re going to see more and more brands trying to improve their online and mobile offerings in order to succeed and attract as many consumers as possible. Last year, November sales in physical stores pushed ahead of December for only the second time. The story is even more pronounced online. November sales have soared past their December stablemates for nearly a decade, though since 2015, December sales have actually decreased year on year. We’re not expecting to see this change as we move into peak 2018. Unicorns, unicorns and more unicorns. From the stuff of fairytales to the bedrooms of children across the UK, the mythical creatures are proving to be popular in the run-up to Christmas and there’s no reason this won’t continue towards the big day itself. Other toys that are expected to perform well include the ever-popular Fingerlings range, LEGO and artificial intelligence-related products as more children become interested in technology. Elsewhere, consumer electronics are sure to be another big winner, though the uncertainty surrounding Brexit may cause customers to be slightly more cautious with their cash than in previous years. 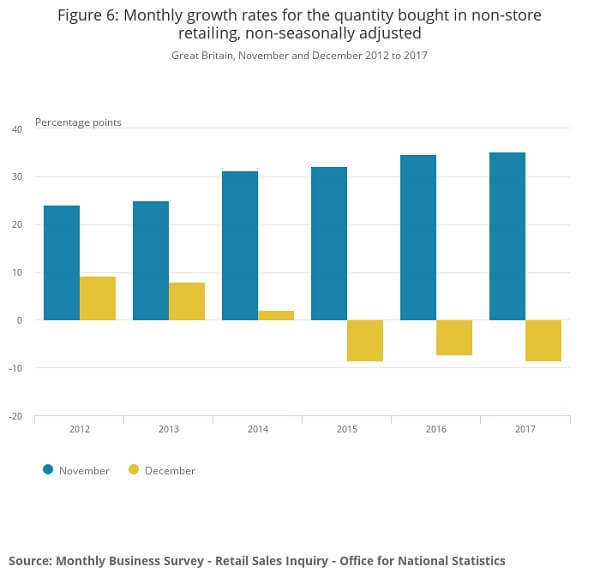 It’s clear to see that retailers are facing increasing pressure to drive sales, especially over Christmas. With Brexit looming on the horizon and the increasing cost of living, shoppers are being extra cautious about how much they spend and where they spend it. The winners of the peak retail war will be those who have enticing offers and embrace mobile shoppers, while those that stay behind the curve may run into trouble as 2019 approaches.